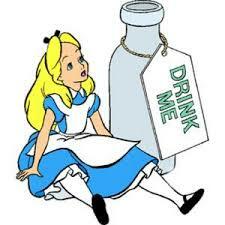 Should Alice in Wonderland Be Rated PG-13? 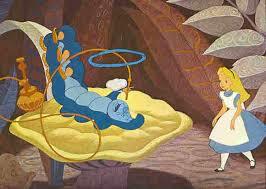 God put me on this earth in 1951 . . . the same year Walt Disney put Alice in Wonderland. A few years later my parents held my hand as we ventured to the Lenora Theater in Pampa, TX to experience our first family movie. Velvet curtains flowed from ceiling to plushly carpeted floors. I was marveled by the biggest candy shop in the whole wide world. I smelled popcorn and butter and . . . I smelled everything. It was awesome and we were still lined up outside. Dad purchased tickets and bought Mom and me some treats. Mom told me years later he went without because we didn’t have enough money for all of us to splurge. My heart was beating in anticipation as a lot of stuff reeled by in black and white and then. . . the lights went completely out. In Technicolor . . .
On the bank of a tranquil river a little girl grows bored listening to her sister read aloud from a history book. She sees a white rabbit carrying a large pocket watch. She follows him and tumbles down a rabbit hole. At the bottom, she tries to follow the rabbit through a tiny door, but she is too big. “Mr Rabbit!”, she calls out. The contents shrink her to a tiny fraction of her original size, but she can not enter because the door is locked. The key appears on a table, but she is now too small to reach it. The cookie makes her grow so large her head hits the ceiling. She cries and her massive tears flood the room. The doorknob points out the “Drink me” bottle still has some fluid inside. She finishes the last drop. She becomes so small she drops inside the bottle. In the bottle’s safety she drifts through the keyhole out to a sea made from her own tears. This is probably the greatest experience to date of my early years on earth and I have just witnessed a little girl drink from a bottle and get small, eat a cookie and get big, drink some more and find safety in a bottle . . . then escape into a sea of her own tears that will soon become a wonderland of illusion, song and magic. By 1966 a red-hot San Francisco group was defining the new acid rock era of music with “White Rabbit” a song written by Jefferson Airplane’s lead singer, Grace Slick. The above video combines the music of Jefferson Airplane with the animation of Walt Disney to help demonstrate the point. Think of the influence this talking white hare who was obsessed with time and his large ticking pocket watch had on us as children in America. We learned we could eat and drink our way into a wonderland of illusion, song and magic from an imaginary friend who also introduced us to a deck of 52. I was taught how to take a toke at a very early age by a hookah smoking worm.
. . . in Technicolor. This entry was posted in Things That Influence Me. Bookmark the permalink. I’m with you. I am very content to live with the rabbit and his friends I met 53 years ago. If Val Kilmer had played the Hatters part, or Mickey Roark, I might have to reconsider, but Depp isn’t going to sway me. What do you think of the new movie coming out with Depp as the Mad Hatter? It looks good, but at the same time I like what’s already in my head (mostly the book version). We have been subjected to the most amazing amount of things in our lives, especially when we were kids. Think about it. We had the cartoons full of violence, murder, sexual stalking (oh yeah, well what about Pepe la Pew??). We had the Three Stooges who made assault a family way of life. We had constant gun fights on TV–via cowboy movies, detective stories, police stories, etc. Everyone smoked on TV and drank, sometimes heavily. Why, Dean Martin was no good sober! Wrestling came on every Saturday and you were shouted down if you said it wasn’t real! They sold every kind of snake oil imaginable on TV as the real thing (I think that one is still with us). SO HOW DID WE GROW UP AND BE SUCH SOLID CITIZENS??? ?